The natural beauty is unbeatable. If you want to experience the pleasure of heaven on the earth then the presence of nature is the only thing that can make it possible. Well, your visit to the Mawlynnong will definitely make this dream a reality! Although Mawlynnong is quite a beautiful place and it is also close to the nature. It has noteworthy history and cultural attractions as well but the most important thing that is highlighted most about this place is its neat and clean picture. It was declared the one and only cleanest village in entire in Asia in 2003 and cleanest village of India in the year 2005. Also, you can call it a culture of this place that the people of Khasi tribe grow actual incredible living root bridges that is a great treat for eyes to watch. 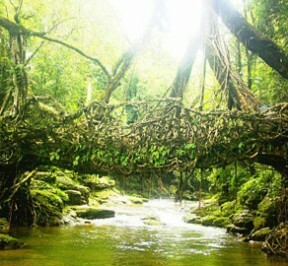 This would be the most amazing exploration for you of this place to see the living bridge of Mawlynnong. And as far as the weather and atmosphere is concerned, this place will always be a best place to visit because the weather of Mawlynnong is perfectly suitable for a perfect trip planning for all tourists! In fact, this could be the best and most suitable place for you to visit because it is actually a very big surprise in comparison of all the other tourism destinations of the world that this village has a perfectly educated population. If we see the percentage of the literacy in this village then we will find it 100%. It is amazing and that is what makes it a perfect place to visit for you because most of the people who stay in Mawlynnong would be able to interact in English language quite efficiently. There would be no problem of language and communication at all. Although visiting Mawlynnong is an adventure because every single part of this place gives the definition of a perfect picture which consist natural beauty all around. But still, there are some noteworthy places that tourists should not miss if they want to explore Mawlynnong perfectly. Thatched hut: If you are interested in cultural exploration of this place even a little then this is a place which you should never miss. You should see this traditional hut of Mawlynnong which is perfectly suitable for all weathers. It was and is still being used by the habitants of Mawlynnong. Living Root Bridges: This is the specialty of Mawlynnong and people come here to see these living bridges from all around the world. These are amazing and incredibly beautiful bridges. The roots of the trees make the pathway bridge that allows people to cross the river or stream. Sky Walk: If you are not afraid of heights then trying the adventure of Sky Walk would be really very adventurous for you. In Mawlynnong, you will find such a broader and wider use of bamboo. This place is the significant example of importance of bamboo in this place. You will get a chance to experience the feeling when you are at the 85 feet height. Mawlynnong Waterfall: This place is very close to nature and therefore you will see here so many attractive sights which will make you gaze for a moment. Mawlynnong Waterfall will also give you one of the most attractive and out-standing experience of visiting this place. This waterfall is beautiful and you can also call it the perfect addition of grace in the astonishing scenery of Mawlynnong. Mawlynnong Village: There are numerous attractions in this place. As you can see it is one of the most neat and clean village, there are plenty of beauty for your camera to capture in this place. So, if you want to explore the natural beauty then you cannot find the better option for your tour than Mawlynnong because the entire village is the reason of attrition of the people. You will find interesting beauty of nature and presence of culture in every single corner of this place so there is plenty to discover for you. Boulder balancing: If you want to see the attractions of this place then apart from the clean village and living root bridge, it will interest you to see the strange natural wonder of the Boulder Balancing that the people of this place do on another rock. Mawlynnong is a perfect example of what a village should be. It holds the spirit of cleanliness and all villagers have maintained it pretty well with their self-sustained efforts for this purpose. In short, it is a great opportunity to see Mawlynnong with your own eyes because it is far more beautiful than pictures when you will see it in reality.